Ellen Gallagher came to prominence in the 1990's during a highly politicized moment in the art world. Censorship battles, art world funding, sexual and racial politics as well as art world inequities were manifesting themselves in artists' work. At the same time, artists were rejecting the overblown painterly gestures of the Neo-Expressionists of the 1980's in favor of creating a more intimate and ideally, a more meaningful dialogue with the viewer. The present work is from a seminal series of large-scale Gallagher paintings that incorporate collaged sheets of pre-ruled school paper. It is this series that garnered the artist widespread attention and for which she is best known. Like her peers Kiki Smith and David Hammons, Gallagher uses corporeal references--skin-like yellow paper and lips--to subtle yet powerfully expressive effect. 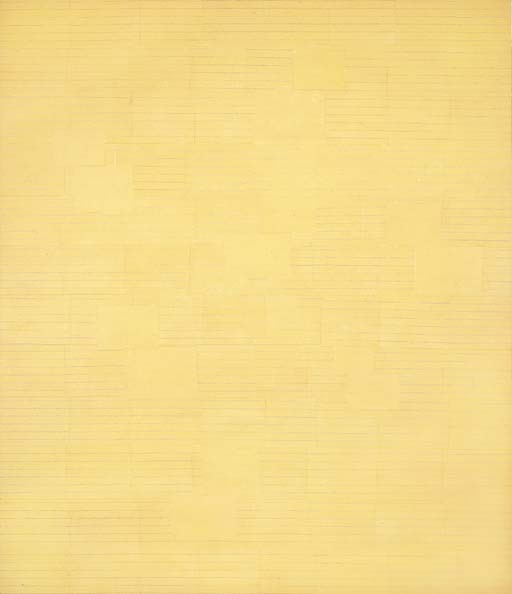 Gallaghers work speaks in the muted voice of minimalism, creating spare grids that bring to mind the contemplative work of Agnes Martin, but upon close inspection, the work reveals its surprise. The lines of the grid include miniature images of African-American lips, that reference the racial stereotype of the Black Ministrel, what Robert Storr referred to as "a kind of graphic slight of hand--'Now you see them, now your don't--which teases viewers who approach her canvases across spacious ccontemporary galleries expecting to be carried off by the spiritual after-draft of the great transcendental winds of early modern abstraction. The void into which Kazimir Malevich launched Suprematist geometries, Gallagher has filled with Mr. Bones to the "dozenth" power. The realm of pure aesthetic delight promised from a distance by nearly monochrome vastness accented by filigree designs, is, on closer inspection, a semiotic briar patch" (R. Storr, Ellen Gallagher, Boston, 2001, p. 32).